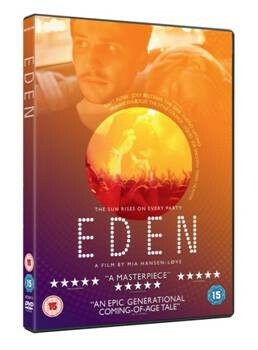 Set for DVD release on 14 December, Eden spins out over the last two decades and chronicles the rise and fall of one of the DJs who pioneered the French electro music scene in the ‘90s. The movie is based on the experiences of Hansen-Løve’s brother (and co-writer) Sven, who was one of the pioneering DJs of the French rave scene in the early-1990s. Mia Hansen Love’s epic film was shot in Paris, New York and Chicago and features cameos from real-life names and music from Daft Punk, Joe Smooth, Frankie Knuckles, Terry Hunter and MK. Paul (Félix de Givry) is a teenager in the underground dance music scene of early-90s Paris. Raves dominate, but he's drawn to the more soulful rhythms of Chicago's garage house scene. He and a friend form a DJ duo called — with unfathomable layers of irony — Cheers. Two of their friends form a group with a similarly odd name: Daft Punk. These young artists plunge into the life, building their following one set at a time, dropping out of daytime society to form a community based on the high of the ceaseless beats and bass. It’s directed by Mia Hansen and stars Felix De Givry, Pauline Etienne, Greta Gerwig, Brady Corbet and Vincent Macaigne.